Primary human bronchial epithelial cells are difficult to transduce. This protocol describes the production of lentiviruses and their concentration as well as the optimal culture conditions necessary to achieve highly efficient transductions in these cells throughout differentiation to a pseudostratified epithelium. Baumlin-Schmid, N., Salathe, M., Fregien, N. L. Optimal Lentivirus Production and Cell Culture Conditions Necessary to Successfully Transduce Primary Human Bronchial Epithelial Cells. J. Vis. Exp. (113), e54176, doi:10.3791/54176 (2016). In vitro culture of primary human bronchial epithelial (HBE) cells using air-liquid interface conditions provides a useful model to study the processes of airway cell differentiation and function. In the past few years, the use of lentiviral vectors for transgene delivery became common practice. While there are reports of transduction of fully differentiated airway epithelial cells with certain non-HIV pseudo-typed lentiviruses, the overall transduction efficiency is usually less than 15%. The protocol presented here provides a reliable and efficient method to produce lentiviruses and to transduce primary human bronchial epithelial cells. Using undifferentiated bronchial epithelial cells, transduction in bronchial epithelial growth media, while the cells attach, with a multiplicity of infection factor of 4 provides efficiencies close to 100%. This protocol describes, step-by-step, the preparation and concentration of high-titer lentiviral vectors and the transduction process. It discusses the experiments that determined the optimal culture conditions to achieve highly efficient transductions of primary human bronchial epithelial cells. The development of replication-defective, pseudotyped lentiviruses (LV) has provided researchers with a safe and efficient method to deliver transgenes in vitro 1. Due to their long-term expression, these LV could also be used for the delivery of therapeutic agents in vivo 2,3. The production of LV requires co-transfection of human embryonic kidney (HEK) cells with several plasmids: transfer vector, packaging gag/pol, packaging rev, and envelope vesicular stomatitis virus glycoprotein (VSV-G) plasmids. Third-generation packaging systems are considered safer than second-generation systems because the rev gene is encoded on a separate packaging plasmid, thereby reducing the possibility of recombination to produce a replication competent lentivirus. Although second generation packaging systems yield five fold higher total transduction units, the split of the original viral genome to create the third generation system has decreased the level of transduction only minimally 3,4. While cell lines can be transduced more easily and efficiently, researchers have shifted their focus to primary cells, because these are more representative of in vivo tissues 5,6. However, primary cells are refractory to transduction. While transduction of fully differentiated airway epithelial cells have been reported, the overall efficiency has not exceeded 15% 7. Described here is a protocol that allows production of high-titer LVs. A step-by-step approach is outlined to achieve almost 100% transduction efficiency into primary HBE cells. More specifically, the protocol describes the optimal culture conditions instrumental to succeed 3. Briefly, HEK 293T cells are transfected using the lentiviral expression vector pCDH with the EF-1 promoter driving expression of enhanced green fluorescent protein (eGFP) or mCherry, a red fluorescent protein, and a third-generation packaging system. LVs released into the media are collected 24 to 72 hr later. The virus particles are concentrated with polyethylene glycol (PEG), a convenient and easy method of viral concentration, before titer estimation using a p24 antigen enzyme-linked immunosorbent assay (ELISA) kit. Subsequently, undifferentiated primary HBE cells are transduced in proliferation media (bronchial epithelial growth medium or BEGM) 8, while attaching (after being trypsinized), at a multiplicity of infection (MOI) factor of 4, adding hexadimethrine bromide and incubating for 16 hr (overnight). The cells are then allowed to differentiate. Since the viral transgene is expressed long-term (using the appropriate promoter, see discussion), expression will be maintained throughout differentiation into a pseudostratified airway epithelium or can be induced (using an inducible promoter) after differentiation. This protocol is of broad interest to researchers who want to use primary HBE cells instead of cell lines, and might be adaptable to other difficult to transduce cell types. Prepare HEK cells media (referred as HEK media) by adding 10% (v/v) fetal bovine serum (FBS) and 1% (v/v) penicillin/streptomycin to high glucose Dulbecco's Modified Eagle's Medium (DMEM). Coat one 10 cm tissue culture dish with collagen I. Mix 30 µl of collagen I in 2 ml of distilled water. Spread the mix onto the dish and incubate for 2 hr at 37 °C and 5% CO2. Remove the mix and let the dish dry in a laminar flow cabinet for 15 min. Plate HEK cells onto the coated dish at a density of 1 x 106 cells in 10 ml HEK media and incubate at 37 °C and 5% CO2. When HEK cells are 50-60% confluent (Figure 1a, 2-3 days after plating), proceed to stage 2. Visual assessment of confluency is sufficient. No quantification is needed. Note: HEK cells are cultured in HEK media (see above). When they reach confluency, they can be split (e.g. 1/5) or frozen down for later use. Note: The protocols should be executed in line with institutional and governmental regulations under BSL-2+ (enhanced BSL-2) conditions in the USA. Transfect using a calcium precipitation procedure (lipofectamine and other transfection agents were not as efficient as the calcium precipitation procedure). Use of a commercial transfection kit is recommended to assure reproducibility, though the procedure is modified as follows. Bring all reagents to room temperature. This is day 0. For each 10 cm dish of HEK293 cells, mix 4.5 µg of envelope DNA pMD2-VSVG, 7.5 µg packaging DNA pMDLg/pRRE, 3.75 µg DNA pRSV-rev, 10 µg DNA of lentiviral expression vector, 86 µl of a 2 M calcium solution, and sterile water in a 15 ml centrifuge tube to a final volume of 700 µl (the latter two solutions are provided in the commercial transfection kit). Drop-wise, add 700 µl of 2x HEPES-buffered saline (HBS, provided in the transfection kit) while vortexing (in the laminar flow cabinet) and incubate at room temperature for 30 min (perform step 4 while waiting). During the early incubation time, deposit 5 µl of the mix on a slide. Check the droplet under a microscope with a 10X objective, focusing slowly up and down. A fine precipitate should be visible, confirming the calcium phosphate precipitation process (Figure 1b). Stop the precipitation after 30 min by adding 10 ml of HEK cells media and pipette up and down to mix. Take the dish of HEK cells from step 2.1-2.5, and remove the medium (day 0). Add the precipitate solution from step 2.5 carefully and slowly along the edge of the dish. On the next day (day 1), remove and discard the medium containing the precipitate and replace it with 10 ml of HEK medium. Check for the fine precipitate under the microscope: it should be visible in the dish in empty spaces between the cells (Figures 1c and d). On day 2, collect media with a syringe, filter through a 0.45 µm syringe filter into a 15 ml centrifuge tube containing 3.8 ml of a 40% polyethylene glycol (PEG) solution. Invert 5x to mix and store at 4 °C for at least 24 hr (for the PEG precipitate to form, but no longer than 5 days) until all of the virus collections are complete. Repeat step 2.8 on days 3 and 4. On day 4 do not replace with HEK medium but decontaminate with 10% bleach and discard the dish. Centrifuge all the collection tubes (usually all collections together on day 5) at 1,650 x g for 20 min at 4 °C to pellet the virus. Remove and discard the supernatant, and spin again at 1,650 x g for 5 min at 4 °C to collect and remove any remaining of PEG supernatant. Resuspend the pellet of each tube in 200 µl of bronchial epithelial growth medium (BEGM) without amphotericin B 8. Pool them together and aliquot at 200 µl. Store virus at -80 °C. Aliquot an additional 10 µl to perform the HIV-1 Gag (p24) antigen ELISA assay. Using a commercial ELISA kit, perform a p24 antigen assay according to manufacturer's protocol. The assay gives an estimate of viral p24 in pg/ml. Plate HBE cells in 10 ml BEGM media (with 100 µl amphotericin B if passage 0 cells are used to eliminate possible fungal contamination) at a density of 1 x 106 cells in a collagen I coated 10 cm tissue culture dish. Incubate at 37 °C and 5% CO2. On the next day, remove the medium and replace with 10 ml BEGM (with 100 µl amphotericin B for passage 0 cells) for a total of 4 days. Return to incubator. After 4 days, use only BEGM without amphotericin B. Change media every other day. When cells are 80-90% confluent (Figure 2a; ~7 days after plating), proceed with transduction (pay attention to 3.5 for preparation before transduction). Again, visual assessment of confluency is sufficient. No quantification is needed. Prior to transduction, coat the permeable support inserts with a collagen IV solution diluted 1/10 with sterile distilled water. Add 200 µl to each insert and let dry overnight in the laminar flow cabinet. Remove media, add 3 ml of 0.1% trypsin in 1 mM ethylenediaminetetraacetic acid in phosphate buffered saline (EDTA/PBS) and incubate 5 min at 37 °C and 5% CO2. Check under the microscope (10X objective) to see if all the cells are detached. If not, return to the incubator for an additional 5 min. When all cells are detached, add 3 ml of soybean trypsin inhibitor (SBTI 1 mg/ml), mix and transfer to a 15 ml centrifuge tube. Pellet the cells by spinning at 460 x g for 5 min at room temperature. Remove supernatant and resuspend pellet into 3 ml of BEGM and proceed with counting. Resuspend HBE cells (now passage 1 or P1) at a ratio of 2 x 105 cells per one 12 mm permeable support insert in 400 µl of BEGM (see Table 2). Extrapolate these numbers based on the amount of permeable support inserts that will be transduced. Table 2: Media extrapolation per cell count. Using a multiplicity of infection (MOI) factor of 4, add the appropriate volume of virus to the cell suspension. Add hexadimethrine bromide to a 2 µg/ml final concentration. Dispense 400 µl of the mix (BEGM, HBE cells, virus and hexadimethrine bromide) per permeable support insert into the apical compartment, and add 1 ml of BEGM alone to the basolateral compartment. Incubate overnight at 37 °C and 5% CO2. Always plate HBE cells without virus as control and test puromycin selection if applicable. On the next day, remove apical and basolateral media, wash with PBS, and replace both compartments with air-liquid interface (ALI) media 8. When cells are confluent, remove apical fluid (known as establishing an air-liquid interface). Continue changing the medium (ALI) in the bottom compartment every other day until they reach full maturity; usually 3 to 4 weeks later. Note: If the lentiviral vector contains a selection gene such as puromycin, cells can be selected by adding puromycin according to a selection concentration curve. For HBE cells, a concentration of 1 µg/ml has been determined to be ideal for consistent selection of transduced cells. However, this concentration might differ for other cells or conditions and should be determined by killing curves. Addition of puromycin can start as early as one day after the media has been replaced by ALI media or later (2-3 days) to allow the full expression of the selection gene. Be sure to add puromycin to one insert that has not been transduced. Puromycin can be added until the cells are fully differentiated. Figure 1 depicts different key steps of assessing cells and solutions during the transfection process. Figure 1a shows the optimal confluency of HEK293T cells prior to transfection for virus production. It is important that the cells are distributed evenly throughout the dish. Figure 1b reveals the precipitate in a drop of the transfection mixture using bright field optics and a 10X objective. The more the precipitates look like sand grains rather than agglomerates, the more efficient the transfection will be. In this picture, the precipitate is a bit coarse. The precipitate is a reliable indicator whether the transfection will produce a high-titer of virus. If any of the ingredients is either missing or of poor quality (vector DNA for instance), agglomerates will form, which is an ominous sign. If this is the case, it is wiser to abort and restart the procedure, making sure that all the ingredients are in the mix, and/or checking the quality of the vector DNA and packaging DNA. Figure 1c shows the same dish as A, after overnight incubation. The precipitate is (and should be) visible in between cells. We noticed that the cells do not multiply much during the 24 hr following transfection. Figure 2 shows how HBE cells look before and 3 days after transduction. Figure 2a depicts approximately 80% confluent primary HBE cells prior to trypsinization and transduction. A 10 cm dish at 80% confluence yields approximately 4 x 106 cells. Figure 2b shows nearly 100% transduction of undifferentiated P1 HBE cells using an MOI of 4 on permeable support insert. When HBE cells are plated on these permeable support inserts, the cells are relatively flat. On this picture, the height of the cells is only a few microns which explains why the 0.4 µm pores are visible though the cells. Figure 3 shows optimization experiments leading to the presented protocol. All experiments have been performed in triplicates on collagen I coated wells (24-well plate), with 2 x 105 primary HBE cells per well. Most experiments used an MOI of 0.4 with a 2 µg/ml final concentration of hexadimethrine bromidein BEGM media. Fluorescent cells were counted 3 days after transduction. Even though the initial optimization of the protocol has been performed on plastic, the results have been confirmed on permeable support inserts. In addition, attempts to transduce fully differentiated P1 HBE cells did not succeed (data not shown), confirming previous reports. As seen in Figure 3a, a higher percentage of HBE cells are transduced in BEGM media compared to ALI. If the cells are plated the day before transduction in BEGM media, the efficiency is significantly decreased compared to transducing while cells are attaching (Figure 3b). When P1 HBE cells are plated the day before transduction in ALI media (instead of BEGM), the transduction efficiency decreases even further (data not shown). The difference between these 2 media is the concentration of calcium. BEGM media contains a low concentration of calcium (0.1 mM) compared to ALI media (1 mM). Calcium forms and maintains tight junctions and therefore, could make it difficult for the virus particles to cross 9 and access their receptors at the basolateral membrane. In fact, some infections were successful at low levels by disrupting tight junctions using ethylene glycol tetraacetic acid (EGTA) for instance 10. As stated previously, fully differentiated P1 HBE cells are refractory and can only be transduced with low efficiencies 5-7, which could be due to tight junctions in high calcium containing media. Another explanation for low transduction efficiency in fully differentiated cells is an active mucociliary transport mechanism where mucus could act as a barrier. Or, as reported by Bals et al., the stage of differentiation in which HBE cells are, is a determining factor of transduction efficiency 10. The fact that more cells get transduced in BEGM than in ALI media supports this statement (Figure 3a). As seen in Figure 3b, an increase of almost 50% transduction efficiency was observed when the cells were transduced while attaching compared to cells plated the day prior. In their study, Ricks et al. showed an increase of 20% when transduction was performed after trypsinization 11. Together, these results suggest that media and the state of maturity of cells is key to transduction success. The panel in Figure 3c, demonstrates hexadimethrine bromideplaying atrivial role in transduction efficiency. Nevertheless, its use is suggested in this protocol since it has no negative impact but could potentially be beneficial. Hexadimethrine bromide is a cationic polymer that is used in virology to enhance transduction efficiencies 12. Others have published the use of protamine, another cationic polymer, but no significant difference was found regarding transduction efficiency compared to hexadimethrine bromide 13. Hexadimethrine bromide does not impact growth nor differentiation 14-16. Finally, different MOIs were investigated in Figure 3d: the highest transduction efficiency occurred with an MOI of 4. There was no significant difference between MOI 0.4 and 4, however, MOI 4 transduced 100% of HBE cells whereas MOI 0.4 only transduced 75%. The MOI defines how many virus particles will have the potential to infect one cell. There are different methods to determine the MOI. One of them is to define the number of transduction units (TU). Using an ELISA, the amount of p24 antigen can be determined in pg/ml. Viral p24 in picograms can be converted in TU, which are necessary to calculate the MOI. The MOI is calculated by dividing the number of TU by the number of cells. There are 10-100 transduction units (TU) per picogram p24. All references in the text regarding MOI are based on calculations with 100 TU per picogram p24. (http://tronolab.epfl.ch/webdav/site/tronolab/shared/protocols/TUvsp24.html). Figure 1: Transfection of HEK 293T cells. (a) HEK 293T cells grown to 50-60% confluency as seen under a 10X objective. (b) Precipitate visible in a 5 µl drop 5 min after mixing all reagents under the microscope (10X objective). (c) Precipitate in the dish next to the cells,following overnight transfection (10X objective). (d) Magnification of center of (c). White arrow pointing to precipitate. Scale bar = 100 µm; is the same for a, b, and c. Please click here to view a larger version of this figure. Figure 2: Transduction of NHBE cells. (a) HBE cells grown in a collagen I coated dish to 80-90% confluency (approximately 4 x 106 cells) in BEGM media for 5 days (10X objective). Scale bar = 100 µm. (b) eGFP transduced HBE cells on permeable support inserts (12 mm), 3 days post transduction (confocal, 20X). At this state, HBE cells are flat and the membrane's pores are visible. Scale bar = 100 µm. Please click here to view a larger version of this figure. Figure 3: Optimization of transduction protocol. (a) Impact of media on transduction efficiency. 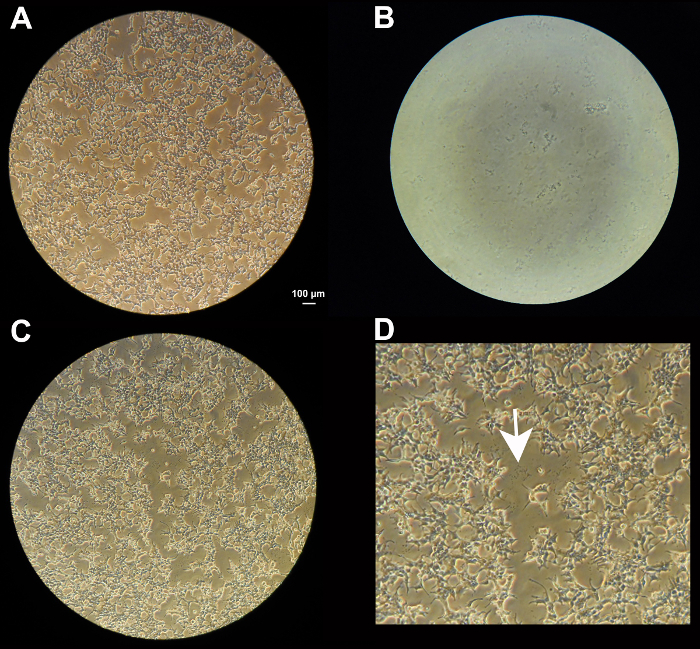 (b) Comparison of transduction in HBE cells plated the day before and transduction of cells while attaching. (c) Influence of hexadimethrine bromide on transduction efficiency. (d) Evaluation of improved transduction efficiencies using different MOIs. Analysis was performed using Student's t-test or Kruskal-Wallis and Dunn's multiple comparison test. Error bars represent SE and all * represent p <0.05. Please click here to view a larger version of this figure. The protocol outlined here assures close to 100% transduction efficiencies. However, there are steps during the process that are important to achieve this goal. For instance, during the transfection process, the presence of precipitates in the transduction mix (drop) or in the dish the day after transduction (Figures 1b and d) are both relevant for a good transfection. The absence of a precipitate or the presence of agglomerates can be due to an omission of one of the transfection reagents, a pH issue, or a bad plasmid preparation. If the precipitate is missing, there is a high likelihood that none will be visible the next day. Furthermore, adding the transfection mix or HEK media too fast may cause the HEK cells to detach, hindering transfection and yield. Another indication of a good yield is at day 6 before the centrifugation step: a white precipitate should be visible in the bottom of the tube. A bad transfection with almost no virus will not create this white precipitate. During the transduction process, it is crucial to use primary HBE cells that have been de-differentiated and that are in a stem-cell like state in order to achieve high transduction efficiencies. The use of a vector containing a fluorescent protein such as eGFP or mCherry that is easily visualized can be a good tool. Modifications could be made to adapt this protocol to different primary cells. One approach would be to reduce the calcium concentration in the media. As seen in Figure 3a, using BEGM media that contains a lower concentration of calcium resulted in significant higher transduction efficiency in primary HBE cells. Another approach could be to increase the MOI. As shown in Figure 3d, the higher the MOI, the better the transduction efficiency. However, using a higher MOI might become toxic to some cells. Nevertheless, there are some limitations to this protocol. This technique has been developed using passage 1 HBE cells. Lungs rejected for transplant were obtained with appropriate consent for research conforming to the standards set by the declaration of Helsinki. Obtaining primary HBE cells from commercial sources can be expensive. These cells are usually also only available at a higher passage. This protocol has not been tested on passages higher than 2. Another limiting factor is the p24 ELISA antigen assay. Several companies offer the kit but at high cost. In addition, the viral concentration given by the assay, is only an approximate value since the test detects lentivirus p24 and free p24 released during transient transfection 17. Therefore, this evaluation of MOI is only an estimate. Finally, using different expression constructs (larger or smaller in size) may not give the same results. For instance, different efficiencies were recorded using mCherry and eGFP (data not shown). There are advantages to this protocol over other methods. One of them is the transfection process. In fact, the proposed protocol can yield such high virus titers that the collected media containing viruses will no longer need to be concentrated and could be used directly to transduce cells. Polyethylene glycol (PEG), used in this protocol to concentrate virus, has been known to be toxic to mammalian cells 18. In addition, if higher MOI were used, this would increase the toxicity risk even more. However, if the PEG concentration step becomes obsolete, researchers that have been unsuccessful to transduce due to toxicity effects might reconsider the use of lentiviruses. Another advantage of this protocol is the lack of differences in transduction efficiencies on plastic or permeable support inserts. The benefit of being able to transduce on plastic is that fewer cells and virus particles are needed. As a result, the cells can be expanded post transduction and transferred onto permeable support inserts when confluent (data not shown). The choice of vectors depends on several issues, such as selection of transduced cells with puromycin or expression of marker proteins such as green fluorescent protein (GFP). There are multiple commercial vectors available that are suitable (pRRLsinPPT.CMV.MCS.Wpre, pCDH-EF1-MCS-IRES-Puro, pCDH-EF1-MCS-T2A-Puro, pGEM-T Easy) 15,19-21. Selection of promoters poses challenges, since the commonly used CMV promoter is silenced in differentiated airway epithelial cells 15. For ciliated cell-specific expression, use of the fox-j1 promoter is recommended. Alternatively, the EF-1 promoter can be used for expression in all airway cells 20,21. If protein overexpression is sought, the size of the insert will determine, in part, transduction efficiency. However, large sizes can be accommodated as seen by successful transduction of full-length soluble adenylyl cyclase 22.The lab has published several successful overexpression constructs 15,16,20-22. For shRNA expression (usually under the U6 or H1 promoter), multiple constructs will have to be explored. This can be tedious with tests done at the end of differentiation (PCR and western blotting), but the process cannot be abbreviated since non-differentiated cells may not be a good representation of success for cells undergoing differentiation. Again, the lab has published multiple successful shRNA constructs 14,20,21,23. Using this protocol, more researchers might be enabled to significantly improve previous poor transductions. Some might find it useful to increase the efficiencies by making a few adjustments. Some might use this tool to discover new biological processes or to be able to prove concepts, both using knockdown or overexpression strategies. We thank the Life Alliance Organ Recovery Agency of the University of Miami for providing lungs. We also thank Dr. Lisa Künzi for the DNA preparation used for the experiments shown in Figure 2B and 3-D, Dr. Ben Gerovac and Lisa Novak for the mCherry virus used for the experiments in Figures 3A to C. We also thank Gabriel Gaidosh from the imaging facility, Department of Ophthalmology at the University of Miami. This study has been sponsored by grants from the NIH, the CF Foundation and the Flight Attendant Medical Research Institute to Dr. Matthias Salathe. Ding, B., Kilpatrick, D. L. Lentiviral vector production, titration, and transduction of primary neurons. Methods Mol Biol. 1018, 119-131 (2013). Sinn, P. L., Sauter, S. L., McCray, P. B. Jr Gene therapy progress and prospects: development of improved lentiviral and retroviral vectors--design, biosafety, and production. Gene Ther. 12, 1089-1098 (2005). Cribbs, A. P., Kennedy, A., Gregory, B., Brennan, F. M. Simplified production and concentration of lentiviral vectors to achieve high transduction in primary human T cells. BMC Biotechnol. 13, (2013). Delenda, C. Lentiviral vectors: optimization of packaging, transduction and gene expression. J Gene Med. 6 Suppl 1, S125-S138 (2004). Gresch, O., Altrogge, L. Transfection of difficult-to-transfect primary mammalian cells. Methods Mol Biol. 801, 65-74 (2012). Jordan, E. T., Collins, M., Terefe, J., Ugozzoli, L., Rubio, T. Optimizing electroporation conditions in primary and other difficult-to-transfect cells. J Biomol Tech. 19, 328-334 (2008). Castillon, N., et al. Regeneration of a well-differentiated human airway surface epithelium by spheroid and lentivirus vector-transduced airway cells. J Gene Med. 6, 846-856 (2004). Fulcher, M. L., Gabriel, S., Burns, K. A., Yankaskas, J. R., Randell, S. H. Well-differentiated human airway epithelial cell cultures. Methods Mol Med. 107, 183-206 (2005). Gonzalez-Mariscal, L., et al. Role of calcium in tight junction formation between epithelial cells. Am J Physiol. 259, C978-C986 (1990). Bals, R., et al. Transduction of well-differentiated airway epithelium by recombinant adeno-associated virus is limited by vector entry. J Virol. 73, 6085-6088 (1999). Ricks, D. M., Kutner, R., Zhang, X. Y., Welsh, D. A., Reiser, J. Optimized lentiviral transduction of mouse bone marrow-derived mesenchymal stem cells. Stem Cells Dev. 17, 441-450 (2008). Davis, H. E., Morgan, J. R., Yarmush, M. L. Polybrene increases retrovirus gene transfer efficiency by enhancing receptor-independent virus adsorption on target cell membranes. Biophys Chem. 97, 159-172 (2002). Horani, A., Nath, A., Wasserman, M. G., Huang, T., Brody, S. L. Rho-associated protein kinase inhibition enhances airway epithelial Basal-cell proliferation and lentivirus transduction. Am J Respir Cell Mol Biol. 49, 341-347 (2013). Manzanares, D., et al. Functional apical large conductance, Ca2+-activated, and voltage-dependent K+ channels are required for maintenance of airway surface liquid volume. J Biol Chem. 286, 19830-19839 (2011). Schmid, A., et al. Real-time analysis of cAMP-mediated regulation of ciliary motility in single primary human airway epithelial cells. J Cell Sci. 119, 4176-4186 (2006). Unwalla, H. J., Ivonnet, P., Dennis, J. S., Conner, G. E., Salathe, M. Transforming growth factor-beta1 and cigarette smoke inhibit the ability of beta2-agonists to enhance epithelial permeability. Am J Respir Cell Mol Biol. 52, 65-74 (2015). Geraerts, M., Willems, S., Baekelandt, V., Debyser, Z., Gijsbers, R. Comparison of lentiviral vector titration methods. BMC Biotechnol. 6, (2006). Schneiderman, S., Farber, J. L., Baserga, R. A simple method for decreasing the toxicity of polyethylene glycol in mammalian cell hybridization. Somatic Cell Genet. 5, 263-269 (1979). Schmid, A., et al. Soluble adenylyl cyclase is localized to cilia and contributes to ciliary beat frequency regulation via production of cAMP. J Gen Physiol. 130, 99-109 (2007). Manzanares, D., et al. Airway Surface Dehydration by Transforming Growth Factor beta (TGF-beta) in Cystic Fibrosis Is Due to Decreased Function of a Voltage-dependent Potassium Channel and Can Be Rescued by the Drug Pirfenidone. J Biol Chem. 290, 25710-25716 (2015). Manzanares, D., et al. IFN-gamma-mediated reduction of large-conductance, Ca2+-activated, voltage-dependent K+ (BK) channel activity in airway epithelial cells leads to mucociliary dysfunction. Am J Physiol Lung Cell Mol Physiol. 306, L453-L462 (2014). Chen, X., et al. A soluble adenylyl cyclase form targets to axonemes and rescues beat regulation in soluble adenylyl cyclase knockout mice. Am J Respir Cell Mol Biol. 51, 750-760 (2014). Ransford, G. A., et al. Pannexin 1 contributes to ATP release in airway epithelia. Am J Respir Cell Mol Biol. 41, 525-534 (2009). Using the methodology described, were you able to get these Primary HBE's to fully differentiate after the lentiviral transduction? Hi Eugene. Yes, primary HBE cells differentiate just fine after the transduction. However, it depends what shRNA is used. If the gene silenced is important for the differentiation process, this might be an issue. Let me know if there is anything I can help you with. Here is my email address nschmid@med.miami.edu. Yes, they differentiate very well. See refs 15 and 22 for examples.